Is It Possible to Get Too MUCH Fermented Food in Your Diet? So you want the health and beauty benefits of probiotics, but aren't sure how much is right for you? Find out how much is too much and what to do to make probiotics work for you. 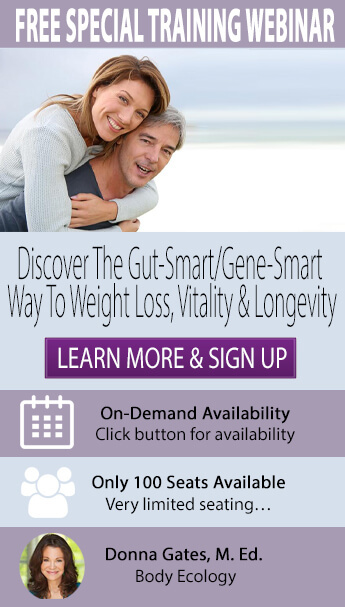 Experiencing gas and bloating or other symptoms when you consume fermented foods and drinks? How can you tell if your symptoms are part of the natural cleansing process or if you've had too much? This article will explain the guidelines for identifying how to get the most of your healing fermented foods and drinks...and when you've had too much. Probiotics literally means "for life." Probiotics are the healthymicroflora (beneficial bacterial and yeast) that live in your intestines, keeping you healthy and strong. When you have plenty of healthy microflora in your gut, you have a healthy inner ecosystem. Unfortunately, most people have an imbalance between healthy microflora and pathogenic microorganisms, setting the stage for illness and disease. Candida albicans is just one example and researchers at Rice University estimate that 70% of Americans have candida. Personal care and cleaning products, including anti-bacterial cleaners. Too much sugar and other acid-producing foods and drinks. Poor diet - too many processed foods. So what happens when you start to consume probiotics? The first thing you may notice is that these "good guys" go to work cleaning up your digestive system, so symptoms like gas and bloating are common at first. Leonard Smith, M.D., is a renowned gastrointestinal, vascular and general surgeon as well as an expert in the use of nutrition and natural supplementation. As a surgeon, Dr. Smith has first-hand experience of the problems associated with faulty digestion and the surgical necessities they can cause. For the past 20 years, Dr. Smith has investigated many holistic medical programs, including nutrition, exercise, chelation, stress management and the relevance of mental and spiritual attitudes in healing. Acknowledging the effectiveness of whole organic foods and nutritional supplementation, Dr. Smith strives to stay on the leading edge of research and breakthroughs in the field of functional nutrition. Fermented foods and drinks have many benefits for your internal health and external beauty, so it's no surprise that we are eager to add them to our diet. However, it is possible to get too much of any good thing. This is a common mistake, especially in the beginning. On a quest to heal, you may end up consuming too much fermented foods and drinks. How much probiotics should you consume? How much is too much? However, I believe you CAN have too much probiotics and your body will let you know. You can also get tested, which I outline below. If you have uncomfortable diarrhea, constipation, gas and bloating or other symptoms, back off for awhile or reduce the amount you are consuming, then build up slowly. The key is to start small: ½ cup of cultured vegetables or 2 oz. of your favorite probiotic liquid is a good place to start. You may experience symptoms of "die off," as the "bad guys" (candida, pathogenic bacteria and parasites) die and leave your body. These symptoms can include digestive pain like gas and bloating, headaches, flu-like symptoms and skin eruptions. As your body gets used to fermented foods and drinks, you can start to add 1 additional serving at a time. For example, you may add another ½ cup cultured vegetables or 2 oz. of probiotic liquids with 2 or more meals per day. Eventually, you can work up to having a serving of cultured vegetables and probiotic liquids at every meal or possibly, as a between-meal snack. If you don't tolerate probiotics, it could be that you are already "over-fermenting" in your digestive tract. This can happen for a variety of reasons, such as an overgrowth of pathogenic bacteria and yeast. You have elevated levels of indican in your urine - which could indicate an overgrowth of pathogenic bacteria and toxins. You have an elevated D-arabinitol/L-arabinitol ratio in your urine - you likely have an overgrowth of candida in your small intestine (even if the candida does not show up in a stool test). Your urinary level of D-lactate or D-lactic acid is elevated - this may mean you have too much Lactobacillus (good bacteria), which can create an acidic condition in your body. If you are over-fermenting, you'd experience digestive upset from taking probiotics, particularly gas and bloating. While a little gas is good, too much is not healthy and it would be best to stop taking them until you have repaired your digestive tract. Feeling symptoms of digestive distress like gas and bloating? Help heal your inner ecosystem with digestive enzymes. Learn more about Assist Dairy and Protein and Assist Full-Spectrum enzymes now! Follow The Body Ecology Diet without fermented foods and drinks. The foods on the Body Ecology program are healing, cleansing and nourishing. This system can heal your inner ecosystem and as you start to feel better, you may find you can tolerate small amounts of fermented foods and drinks. Try EcoBloom. EcoBloom is a prebiotic that feeds healthy microflora in your large intestine. This can encourage the "good guys" to colonize in your intestines to balance out the pathogens. Watch your body with any prebiotic (onions, for example), however, because it could also cause you to ferment too much if your body is overridden with pathogenic bacteria and yeast. If you experience the symptoms, like gas and bloating, with a prebiotic as you do with probiotics, you can back off and add it later as your inner ecosystem heals. Use digestive enzymes like Assist Dairy and Protein, which has HCl (hydrochloric acid). Digestive enzymes and HCl help your body digest and assimilate foods and fight pathogens. You may also want to consider supplementing with taurine, which also increases your HCl production. Slowly introduce CocoBiotic, Dong Quai or your favorite probiotic liquid with Saccharomyces boulardii. Saccharomyces boulardii can knock out clostridial infections (bacterial infections) and helps control candida. Add Fermented Foods, like cultured vegetables. Once you are tolerating probiotic liquids, start to slowly add cultured vegetables into your diet and see how you tolerate them. Probiotics are an excellent way to create lasting health and as you incorporate them into your diet, remember Body Ecology's principle of uniqueness. Finding a good health care practitioner who can support your natural healing process is a great way to get the support you need. And above all, we are all unique, so listen to your body's signals when trying any new food or supplement. Leonard Smith, MD, is a featured guest in Donna Gates most important and beneficial at-home training ever, The Body Ecology Detoxification Training Program. No matter who you are or what your health goals, this is one event you don't want to miss ... and it is all from the comfort of your home! Learn More and Enroll Today! Zhang, Joe. Probiotics: The Future of Preventative Medicine. Probiotic Microbes Could Be A Key to Good Health. Medical News Today. March 2006. Sensory Issues and Gut Reactions: Autism and the GI Tract. Presentation by Timothy Buie, MD at the Minnesota Autism Society of America conference April 25, 2003. Probiotics:Your gut's love affair with bacteria. CBC News. March 2007. Getting To Know "Friendly Bacteria." CAM at the NIH. Summer 2006.